Last week we played with friend Miltiades. We had only three hours free, so I chose Simbach, I read it recently and I found that it could produce a short and exciting game! I would like to thank Damnitz for this scenario, as we enjoyed much playing it! Here is the battlefield, viewed from the Austrian side. The river is my Photoshop effort to produce easily transported, expendable paper terrain. Gabrieli (4 Foot, 1 Grenadiers, 1 Artillery), Fabretti (2 Foot) and Preysing (3 Cavalry) - the third cavalry arriving at round 2. Nadasdy hussars flank marched on turn 2. According to the scenario, the Austrians have to dice and one by one, their brigades, manage to cross the river. Only Thüngen with his two line infantry (opposite Simbach village) delayed for several rounds to bring the 5 or 6 needed to cross the river. Simbach is in flames and is impassable. 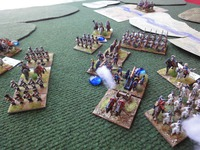 Gabrieli's brigade tries to maneuver in position, but brings a 1 for two consecutive turns. Second picture: Preysing's cavalry brigade (center of photo) maneuvers perpendicularly to the river to anticipate the oncoming Austrians. But why we see one of the two cavalry regiments? The two Austrian batteries, now shown limbered, bring a 6, make a double move and unlimber, opening a devastating flanking fire with great odds! +2 canister, +1 flank, +1 vs unit classed as inferior, -1 moved. It was a real disaster for one of the inferior Bavarian cavalry regiments, it received four hits and rertreated before I blinked my eye! The cavalry brigade was much needed to protect the infantry which was still maneuvering, not being able to form an effective firing line. 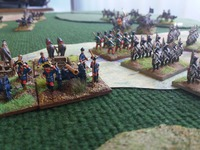 The Bavarian infantry regiments still unable to form a firing line. Fabretti's brigade brinks a 6 (what a joy!). But the C-in-C is dithering and must reroll! They roll a 1 and stay in place. 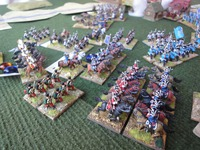 The independent Bavarian grenadiere zu pferd try to join the rest of the remaining cavalry. I manage to join all the Bavarian cavalry regiments. In the ensuing cavalry melee the Austrian cavalry retreats, but the Bavarian cavalry is done for, so the Bavarian cavalry brigade is exhausted. The infantries come to contact. The Austrians have the upper hand. Thüngen brigade, in column, turns around Simbach village. They deploy... and get a bloody nose from a devastating canister and musket fire, sending one of the two regiments reeling back with four hits. The last phases of the battle saw the weak Bavarian Fabretti brigade attacked by Austrian grenadiers and being annihilated.